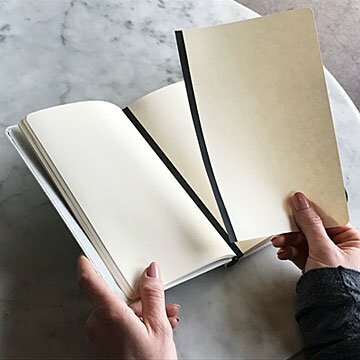 Instantly re-organize your notes by moving and reconnecting the pages of this magnetic hardbound notebook. Charles Good-Man's brilliant design blends paper's flow and permanence with digital's flexibility. It looks and feels like the high quality hardcover notebooks favored by thinky types in coffee shops, with one mind-blowing difference: the pages are "bound" to a magnetic spine, so you can pull them out and put them back in anywhere you like. That means all your sporadic notes about cats, donuts, and existence can be totally organized—and 100% unavailable to the hackers who just loved your old online diary. Vegan leather binding. 55 sheets/110 pages (refills, too). Made in China. Charles Good-Man, founder, graduated from Westmont College in Santa Barbara with a degree in art. After college, he worked as a freelance graphic designer for various companies. Living in California, Charles fell in love with the ocean and enjoys spending his free time surfing. This product contains magnets. Safe near most electronic devices. Always research your specific device regarding using this product in close proximity. This was part of a gift for a friend to help in planning her wedding. This is a perfect way to organize and reorganize wedding logistics. There's so much to keep track of and you never know which areas will end up needing more space for notes. Instead of flipping back and forth, reorganize your magnetic pages! Ingenious! This was a really appreciated gift! The binding has a large magnet in it, and each sheet has a strip of metal(?) on its edgeâ€” so the pages assemble in the book but are not sticking to each other outside of it. A fabulous gift for folks to communicate their ideas to others. I use this book everyday in my architectural firm - very helpful to move pages around and into other books - I use different colored books for different tasks - love this book!!! Couldn't ask for a better notebook!